The bar wrapper shows that heads of the 1916 leaders as well as the Proclamation. A 1916 CHOCOLATE bar has people asking whether measures should be introduced to prevent the commercialisation of the centenary. The bar, which is being sold for €2.99, has received mixed reviews, with some people calling it tasteless and inappropriate. Not exactly what the rebellion leaders had in mind, the wrapper displays their faces as well as the Proclamation. Speaking on RTÉ Radio One’s Liveline, Fianna Fáil councillor Malcolm Byrne said rules should be introduced to protect 1916 symbols. He called for the centenary advisory group to look at the issue and introduce a licensing system for the use of such images and symbols associated with the Rising. “We need to ensure how we make sure it is not overly commercialised,” he said. He said items such as a chocolate are not the appropriate way to mark “a key part in our history”. Byrne said iconic images are being used for private companies to make a profit. He said the chocolate bar may only mark the beginning. “Where will it lead?” he asked. Other callers made the point that a chocolate bar might appeal to younger people more, and therefore spark their interest in the 1916 celebrations. “Anything that can get the message out to children,” said one caller. @Liveline_RTE @Donal_OKeeffe @talktojoe1850 @RTERadio1 Sainsbury's did one to commemorate WWI christmas truce. Poll: Is a 1916 chocolate bar inappropriate? 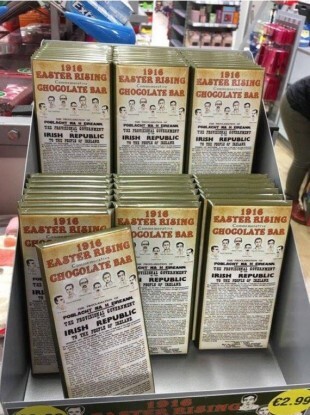 Email “There's a 1916 chocolate bar and some people aren't happy about it”. Feedback on “There's a 1916 chocolate bar and some people aren't happy about it”.